Alphabetically in price ranges, by an average priced room in each establishment. Sorted with the highest priced rooms first. To see this same list with the lowest priced rooms listed first, click here. Click here to go to the main lodging page. Casa Rana - is a designer luxury oceanfront home located 7 miles north of San Pedro that is the perfect place for your Caribbean adventure. Our home includes spacious rooms, exquisite furniture, a gourmet kitchen, our own plunge pool, private beach, dock, and unobstructed views of the ocean. Spend your time relaxing, scuba diving, exploring Mayan ruins, fishing, and enjoying local cuisine. Contact us to make a reservation today. Cayo Espanto - A Private island with only five villas each with its own private pool, dock and Houseman. The ultimate in luxury. Exquisite meals and service within view of San Pedro. La Perla del Caribe - This distinctive resort reflects the elegant style and native ambiance of Belize. Each villa is a uniquely designed testament to luxury. Relax on your private mahogany sun bed and watch the herons stroll through the shallows. Laze by the pool while taking in a miraculous sunset. Or snorkel just off shore with brightly colored tropical fish. Wataview - The only vacation home of its kind on Ambergris Caye. Enjoy resort style living in a private home that lavishly accommodates up to 10 guests. Amenities include; staff of five including a chef, private tennis court, pool, hot tub, outdoor wetbar with icemaker, large outdoor living and dining areas, 200’ of beachfront with pier, two indoor living areas each with 60” LED TVs, 5 spacious bedrooms each with en suite bathrooms and so much more. Vacations are about treating yourself. Come and be spoiled. Azul Resort - The newly completed Azul combines the privacy and space of a private luxury villa with the ammenties and services of a world class resort. We offer two 3000 sq ft 2-bedroom villas (complete w/ Viking kitchens, wireless internet, rooftop spa and other fine ammenities) on 400' of beachfront and 10 acres. Belizean Shores Resort - A full-service, beach front resort offering sea or pool view suites. Each of our spacious suites has a separate master bedroom, fully equipped kitchen, dining and living room area and private balcony or patio. Our activities desk provides scuba diving, snorkeling, sailing, fishing or guided eco-tour excursions to the mainland to explore other districts or ancient Mayan ruins. Banyan Bay - Overlooking swaying palms and the tranquil Caribbean Sea, these spectacular beachfront Villas feature fully equipped kitchens, spacious living areas, and comfortably appointed bedrooms with private bathrooms and Jacuzzi in the master bathroom. All have central air-conditioning, ceiling fans, cable TV and telephone, offering you all the conveniences of home. Casa Blanca Beach Resort - One of San Pedro's newest and most exclusive villas. Experience a unique blend of first-class accomdations, premium resort amenities, and warm friendly service. Best of all, enjoy the personal use of our motorboat and captain for fishing, snorkling, sight seeing or virtually anything else you would like to do - when you want to do it. Casa Miradores - Beautiful custom built contemporary Mexican style beachfront home with infinity edge pool located 2 miles south of town. 2 bedrooms and bathrooms, gourmet kitchen, rooftop deck with outdoor kitchen. 52 windows provide views from every room. Wireless internet. Caye Chapel Island Resort - Blue waters of the Caribbean Sea, perfect weather, ultimate privacy, elegant accommodations, superior service, complete resort amenities including an 18-hole championship golf course - this is Caye Chapel Island Resort. Villa Descanso - is one of six Seascape Villas with private dock and private beach. This huge Villa is approximately 3,700 sq ft with gorgeous ocean views from the kitchen, living room, dining room, veranda, master bedroom and master balcony. Three complete suites with spacious bathrooms. The two downstairs suites have their own private entrances. The huge Great Room has an open floor plan and a breathtaking stairway leading down to the atrium and downstairs suites. A fully equipped kitchen makes stay at home meals a snap but good restaurants are just a short walk north. Spectacular designer pool, Private dock and beach. Just 3.5 miles North with concrete North road to within ¼ mile of Seascape. Please note over 40 FIVE STAR reviews with NONE less than FIVE STAR. Special low pricing From June 1st to mid December. El Pescador Resort - El Pescador is a small hotel located on the Bahia del Punta Arena, Ambergris Caye. Our white sand, coconut palm studded beach is the perfect atmosphere for your relaxing vacation. We specialize in light tackle salt water fly fishing. El Pescador Villas - Our lovely villas have stunning views of the beach and the Belize Barrier Reef across an open expanse of turquoise Caribbean Sea. Our villas are two story, 3-bedroom, 3-bath homes, designed in a lock-off configuration, which enables you to rent a 1, 2 or 3 bedroom villa to perfectly match your individual needs, while ensuring your complete privacy. Esmeralda Del Mar - Esmeralda Del Mar, newly completed ocean front, private home on the beach with pool, available for rental. Two floors with stunning ocean views. First floor: two king bedroom suites, fully equipped kitchen, dining and living room with 60" smart tv. Second floor: master suite, executive office, full kitchen, dining and living room with 65" smart tv. Beautiful 11' deep decks grace the beachfront and pool. Rooftop deck with 360 views. A separate casita is included which features a private porch, living room with futon, kitchenette, bedroom with queen size bed, bathroom with shower. Caretaker on premise. Sleeps 6-8. Grand Caribe - Gracing one of San Pedro, Ambergris Caye’s most beautiful beaches, with a combination of sophisticated comfort and an unspoiled setting, Grand Caribe Suites & Residences is a convenient 15 minute drive from the San Pedro Airport or a 5 minute boat ride away. This Luxury ocean front residence is comprised of 74 one, two and three bedroom Suites. Landscaped pathways connect beachfront and sea-view suites with the main building, white sandy beach, and swimming pools. Best Knows as a haven for uninterrupted relaxation, privacy, a quiet setting, pampering, luxury amenities and attentive personalized services, Grand Caribe Suites & Residences offers a peaceful and secluded environment where the most discriminating travelers find the ultimate in first class ambiance, service and amenities. Indigo Belize - Natural elegance reins in this boutique residential resort. An oasis of pampering and adventure. Every suite is "beachfront" with stunning sea and reef views. Walk-in swimming beach. Bonefish flats nearby and snorkeling just a splash away. Easy access to San Pedro but away from congestion and noise. Nearby fine dining and dive shops. On-site gourmet food-source. Plush interiors, posh linens, gourmet kitchens, lavish bathrooms, TV, Internet, private verandas, AC. Beautiful beach, exotic pool, onsite gym, pier with palapa-lounge. A 5-star service package includes massages, full provisioning, private chefs and more. Las Terrazas - Described as “natural paradise” meets 5-star luxury, Las Terrazas is a Preferred Boutique resort and the only member of Preferred Hotel Group in Belize. Comprised of 38 magnificent one, two and three bedroom full size town homes, the resort is ideal for couples, families or groups. Town homes feature Central A/C, furniture handcrafter from Belizean wood, living room and dining rooms, full size kitchens, washer and dryer, two flat screen Cable TVs, DVD player, i-pod docking station, free internet access, oversized balconies and patios; all with plush furniture. Penthouse units include a private plunge pool on the balcony. Most units have view of the Caribbean with Sea Houses located directly on the beach. Lovin' Belize Villa - Exquisite brand new Dec, 2003, ocean front, three bedroom villa with pool. 1.5 miles north of San Pedro. 1/2 mile of private beach. Beautifully appointed with Central American original artwork and luxurious leather, suede and mahogany furniture. Excellent snorkeling, diving and fishing are a kayak away on the barrier reef. Walk the pristine beaches under a canopy of stars and you'll end your holiday Lovin' Belize. The Palms - On the beach, just minutes from the barrier reef. Our spacious, one and two bedroom condominiums offer all the modern conveniences including daily maid service. Relax by our freshwater swimming pool, surrounded by lush tropical gardens, or sun and swim on our beautiful coral beach. The Phoenix Resort - The Phoenix Resort is a luxury beachfront resort located in San Pedro and on the island of Ambergris Caye, Belize. Playa Blanca Island Villa - Luxurious Beachfront Island Villa complete with BOAT,captain, fishing guide & housekeeper.Snorkel & fish whenever you want~no waiting for large groups. A tropical haven of privacy with extraordinary pleasures of hospitality.Our guest describe Playa Blanca as "simply magical with unrivaled amenities - a jewel in the Caribbean with breathtaking views". Northcoast Ambergris. Portofino Beach Resort - We have just completed one of the finest establishments on Ambergris Caye. The ultimate beach resort on Ambergris Caye, upon a manicured beach just 5 miles north of San Pedro. From June 15th 2001, PORTOFINO will offer 8 beautiful beach Cabanas, 2 sumptious tree top suites and 1 VIP/Honeymoon suite with jacuzzi and Emperor bed covering more than 800 sq.ft. Portofino Mansion - A fabulous beachfront home nestled on a stretch of pristine white sandy beach on the north end of Ambergris Caye; one of the most sought out locations, right next to Portofino Resort, renowned for its fabulous restaurant, this fascinating exclusive air-conditioned beach home comfortably sleeps 5 people on the first floor and up to 4 people on the second floor. Ramon's Village - Sixty-one thatched roof, air-conditioned cabanas; white sand beach, incredible pool, dive center, restaurant, gift shop, 420' pier - a wonderfully intriguing vacation resort! Victoria House Resort & Spa - Victoria House Resort & Spa, one of Ambergris Caye’s most luxurious and awarded resorts is a peaceful retreat located two miles south of San Pedro Town. The ambiance of the resort is one of relaxation, privacy and barefoot elegance. The resort features 2 main guest pools, diveshop and a full service spa and fitness center and is the perfect locale to scuba-dive, snorkel or just unplug” from the rest of the world and rejuvenate yourself. Palmilla Restaurant and Admiral Nelsons Bar at Victoria House are both known for their outstanding cuisine & extensive wine list. X'tan Ha Resort - X’tan Ha "The Waterfront" Resort is a secluded getaway north of San Pedro with beautiful white sand beaches and clear Caribbean waters. This secluded three star resort features 32 one bedroom villas each with private patio or balcony, kitchenette, dining room, living room, private bath with shower, Cable TV, and WIFI. Banana Beach Resort - Banana Beach consists of suites with kitchen, private balcony, King size bed, cable TV, A/C, safe, telephone and a fresh water swimming pool. Located on Mar De Tumbo beach south of San Pedro Town. Belize Beach Suites - Spacious 1BR/2BR fully-equipped, luxury beachfront units at water's edge, w/dramatic, panoramic views of the Caribbean and offshore reef. Beautifully furnished, a/c, fully equipped kitchens, freshwater pool w/decks, cable TV, beachfront bar, dive shop, bicycles, kayaks, full-service spa. Secluded, but 10 minutes to San Pedro. All tours/excursions depart from our dock. Beachwalk to excellent restaurants. Pickups in San Pedro upon arrival. Caring resident management. Belizean Cove Estates - is a complex of eight luxurious oceanfront villas. These spacious villas are three bedroom, three bath with approx 2300 sq ft of floor space. All villas are individually decorated by the owners and feature a fully equipped kitchen. Belizean Cove Estates is located 3 miles north of San Pedro Town on the island of Ambergris Caye. Blue Dolphin - A private and beautiful 5 bedroom home which sleeps 12. Secluded, 160' of white sand beach. 3,000 sq. feet of tile encompasses your own private pool and roof top sunset/sunning deck. Four First class restaurants walking distance from your front door or if you prefer have a pizza delivered poolside. Blue Tang Inn - Located on a sandy Caribbean beach, this fourteen-unit inn is just two quiet blocks north of downtown San Pedro, where you'll discover Belize's warm, friendly people and many great shops and restaurants. The beautiful and recently refurbished accommodations, fun daily activities, unique dining and friendly local culture are all part of what makes a stay at the Blue Tang Inn a truly unique experience. Cap'n Ron's Condos at Paradise Villas - Book direct for huge savings on lodging and diving! On the beach with million-dollar view. Best location at the edge of town. Fabulous pool. Air conditioning. Private dock. Full kitchen. Maid service. And we'll help you plan an unforgettable vacation! Capricorn Resort - Nestled in a beautiful cove right on the ocean front just 3 1/2 miles north of San Pedro Town on Ambergris Caye in Belize. Set in secluded beautiful surroundings, with hammocks to relax in, yet with the charming town of San Pedro within easy reach by bicycle, golf cart, water-taxi, or just an enjoyable walk! Casa Tortuga - Casa Tortuga is a two-story five bedroom villa on the beach in San Pedro, Ambergris Caye, Belize. The beach at Casa Tortuga is 1/4 mile from the reef and Hol Chan Marine Preserve. We have 100 feet of beachfront and are surrounded by 28 coconut palms. Pool is the largest private pool in Belize. Guides can pick you up at our dock for scuba diving, snorkeling, fishing and sightseeing. Less than two miles from the center of town. Caye Casa - Caye Casa is a boutique hotel on the beach - the ideal spot to enjoy and escape - to live the dream. It is an elegant, yet barefoot base, for the adventure of exploring Belize. Located just on the outskirts of town, the spacious suites are convenient, peaceful and private. The three two bedroom villas, the two one bedroom casitas and the two classic rooms all open to the pool, a pier, a private sandy beach and then the ocean. Coco Beach Resort - is a beautiful resort located on the island of Ambergris Caye in Belize. The beachfront resort is secluded yet still a short 3.5 miles north of San Pedro Town. A boat ride, bicycle ride or golf cart ride will get you to the shops and restaurants located in the town center. A Belize vacation in paradise at Coco Beach is the ideal therapy for those who just want to get away from it all! Cocotal Inn and Cabanas - Cocotal Inn and Cabanas is an oceanfront hotel/vacation property located 2 1/2 miles north of San Pedro town. You will find custom designed plantation style buildings and colorful eight-sided garden cabanas on our 1 1/2 acre property. We have a total of 8 units - all have kitchen facilities, dining area, king or queen beds, air conditioning, cable TV, and in room wifi. There is a freshwater swimming pool, a 200 ft ocean pier, and a lagoon sunset pier with access for kayaking. Nightly rates include local arrival and departure transfers as well as use of our bikes and kayaks. Coral Bay Villas - Located less than one mile south of town, Coral Bay Villas offer luxurious fully-furnished, one bedroom beach front condos overlooking the Caribbean Sea with queen bed and double size sofa bed, A.C., ceiling fans, Cable TV, kayak and complementary bicycles. Diamond Reef - Diamond Reef is a quiet getaway located directly in front of the beautiful crystal clear waters of Mexico Rocks. These are gorgeous beachfront units on a private beach and pier. Spacious Luxury Condo with air conditioning throughout, fully equipped kitchen, laundry services. Gracing one of San Pedro, Ambergris Caye’s most beautiful beaches, with a combination of sophisticated comfort and an unspoiled setting, Grand Caribe Suites & Residences is a convenient 15 minute drive from the San Pedro Airport or a 5 minute boat ride away. This Luxury ocean front residence is comprised of 74 one, two and three bedroom Suites. Landscaped pathways connect beachfront and sea-view suites with the main building, white sandy beach, and swimming pools. Best Knows as a haven for uninterrupted relaxation, privacy, a quiet setting, pampering, luxury amenities and attentive personalized services, Grand Caribe Suites & Residences offers a peaceful and secluded environment where the most discriminating travelers find the ultimate in first class ambiance, service and amenities. Isla Bonita Yacht Club - Belize’s only Yacht Club features a beautiful beachfront hotel situated close to the charm of San Pedro Town yet far enough to relax while taking in the magnificent views and refreshing tropical breezes. The Landings at Tres Cocos - provides condominium rentals that will make your vacation truly unforgettable. Located just north of the bridge at the cut, these properties are less than one mile from San Pedro Town. Close to restaurants, bars, and shopping yet far enough away to be quiet and relaxed. All of our fully equipped condominiums offer ocean views, full kitchens, air-conditioning, and your choice of 1, 2 or 3 bedrooms. With over 300 feet of beachfront, you’ll have access to all three fresh water swimming pools, our salt water swimming pool, our swim-up bar, and our beachside barbecue. Los Encantos - Villa Hokol Kin - A 3 bed/3bath private villa 80 steps from sea and beach with large pool on Ambergris Caye,Belize. Great Room,kitchen,dining. Master suite.king and queen beds. Caretaker on property. Mata Rocks - Small Resort. Big Experience. At Mata Rocks, it's the small things that create big memories. Mata Rocks Resort is an intimate beachfront hotel providing personalized service and tropical elegance in a casual relaxed atmosphere. 17 rooms and Jr. Suites all with ocean views, air-conditioning, cable TV and mini-fridges. Jr. Suites have kitchenettes. Freshwater pool and beachfront bar. Mayan Princess - - 23 beautiful oceanfront suites in the center of San Pedro Town with A/C, cable TV, phone, kitchen and seafront verandas. Friendly staff will arrange diving, snorkeling, fishing, or mainland tours. Packages available. Paradise Villas Beachfront Resort - The Paradise Villas are premium-quality condo-townhouses on the Caribbean shore. 24 modern stucco duplexes face the ocean, surrounding a fresh-water swimming pool and tropical garden. Built in 1991, the units, grounds and pool are maintained in pristine condition. Seven Seas Resort - 30% DISCOUNT FOR BOOKING DIRECT. Our one bedroom suites are 30 steps from the Caribbean Sea and have balcony, A/C, kitchen, daily maid service, swimming pool, dive shop, tours & scuba....a 10 minute stroll along the beach to town. Y'all come! Sunbreeze Hotel - We are centrally located at the immediate south side of the heart of the town with easy access to every means of entertainment and water sport activity; yet out of the hustle of the town. An oceanfront property protected by a seawall boasting 42 spacious air conditioned rooms of three categories, an onsite restaurant, bar, freshwater pool, massage studio, art gallery, conference room, and complimentary early morning coffee. Sunbreeze Suites - Sunbreeze Suites is centrally located in San Pedro Town on Ambergris Caye and is one of the Islands newest and most luxurious resorts. We offer 20 fully appointed oceanfront suites with private balconies overlooking the largest barrier reef in the western hemisphere. Whether you are looking to relax and enjoy the charm of this old world fishing village or you are planning on some extreme outdoor activities, we have what you are looking for. Villa La Jolla at Los Encantos - beachfront, two-level villa crafted of local mahogany and sandstone features 3 bedrooms, 3 baths and an unobstructed view to the worldís second largest reef. This fully equipped villa is privately owned, located 4.5 miles north of San Pedro with a pool and palapa for lounging. Bonefishing and SCUBA on your doorstep, fine dining steps along the beach. Xanadu Resort - Xanadu lies hidden on a palm lined beach within walking distance of shops and restaurants. Shady decks overlook the Caribbean and a long pier. Luxury two bathroom suites with central, air, kitchens, cable. Ak'bol - First Class views on our private beach....Life Unplugged....True island living....white sand at your toes... Belize's first family owned Yoga Retreat and Eco Resort...stay at "the Heart of the Village", our 7 private Maya-chic thatched cabanas by the sea with open-air showers...lagoon inspired pool...hammocks throughout....snorkel and drop a line off our pier...home cooked Central American favorites and beach bar @ local prices...yoga and meditation classes offered each day and wellness retreats...natural spa treatments...all within a pristine coconut plantation garden...weddings and honeymooners welcome. Cabanas are priced according to Oceanfront and Garden Cabana with Sea View, according to Peak, High and off Season. Aqua Vista Beachfront Suites - View the blue at AquaVista Beachfront Suites. Magnificent beachfront location with spectacular views of the pristine water all the way to the second largest barrier reef in the world. Amazing neighborhood, genuine people, a place where you're not a stranger for long, experience the real island spirit where our guests are more like family. Your suite will consist of a double dose of relaxation, with all the amenities you would expect to have a warm, home away from home feeling A place you’ll only want to leave to go play and enjoy all the island has to offer. San Pedro Timeshare Rentals - Located in high-end resorts, San Pedro timeshares are the ultimate accommodation for visitors wanting a truly unique vacation experience. Enjoy magnificent views of white sandy beaches, breathe in that fresh ocean air from the privacy of your own balcony, and relish in having all of your family members together in one spacious unit. These resorts also offer a multitude of amenities on-site including: boat rentals, restaurants, bars, scuba diving tours, and spas. Rent a 1-4 bedroom timeshare from SellMyTimeshareNow.com and enjoy savings of up to 70% off! Steve and Becky’s Cute Little Hotel - Set in a breathtaking garden of hibiscus, croton, orchid, and flamboyant, located just steps away from her sister property Ramon’s Village. Sleep in splendid comfort at the Belizean Princess while enjoying everything that Ramon’s Village Resort has to offer. Brianna's Beach House - A quaint and charming house located 3 minutes north of town overlooking the enchanting blue hues of the Caribbean Ocean. This location is both quiet and convenient. Calm Caye Villa - Quiet Belize beachfront villa luxury-private home w/ 2 bdrms, 3 full bath, kitchen/vaulted great rm, terrace, pool, private beach; world class barrier reef scuba, snorkeling, fishing; Ambergris Caye. Casa Caracol - Just a short stroll North along the beach from the very centre of town, Casa Caracol provides all the comforts of home, right on the edge of the Caribbean Sea. This home with 3 bedrooms, 2 bathrooms, large living area and spacious veranda makes for ideal beachside living. Cayo Frances Farm & Fly - A remote, off grid fly fishing and SUP/kayak camp on the leeward side of Ambergris, 1/2 way between San Pedro Town and the Bacalar Chico National Park & Marine Reserve. Corona del Mar - Corona del Mar Apartment/Hotel is one of Ambergris Caye's newest, most spacious and comfortable hotels. Each has a fully equipped kitchen, separate bedroom with two doub1e beds, a hideabed in the living room, a delightfully large bathroom with tub and shower. Costa Blu Dive and Beach Resort - Dive into your undiscovered dreams. Costa Blu Dive and Beach Resort is a unique property that combines pristine Caribbean waters, natural beauty and exceptional personal service to create an idyllic tropical island retreat. The thirty- six one bedroom sea view suites, each with their own private balcony, ensure that no matter where you look, you will always enjoy the beautiful Belizean seascape. We’ll take care of all of your needs: from our full service and PADI-certified dive shop, onsite excursion center, seafront swimming pool, restaurant, pool bar, spa treatments and wide range of activities. Holiday Hotel - Walk through the bright pink doorway of the Holiday Hotel to a world of tropical color. Wiggle your toes in the white coral sand on the expansive beach. 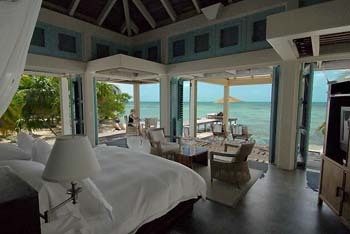 View the blue Caribbean waters from the beachfront verandah of your air conditioned room. Enjoy the beauty of the waves as they break on the reef just minutes away. Hotel del Rio - A low-key, laid-back side of Caribbean living in a setting surrounded by sea grapes, palms, lilies, and banana trees in a serene, tranquil atmosphere. We run a family owned hotel offering a variety of room rentals for all travelers. Located near the San Pedro River on Ambergris Caye beachfront. Parham Plaza - Parham Plaza offers nine nightly accommodations with the most incredible views and location! Our lush front yard and breezy rooftop lounge offer guests the perfect space to relax and enjoy the sights and sounds of the Caribbean. We have plenty of hammocks and comfy seating for all. Don’t forget to check out our cozy treehouse too! Spindrift Hotel - Located on the beach in center of town, private sun deck, 22 a/c rooms, 2 apartments, bar and restaurant. group and weekly rates. Tours available. Ocean Tide Beach Resort- In the town San Pedro, on the island of Ambergris Caye, you will find our beachfront resort with unobstructed reef views from every suite. Enjoy snorkeling, diving, fishing, along with free wi-fi all walking distance to downtown. Grab a drink at the beachside bar "The Lazy Pelican" situated right between our beautiful outdoor pool and the pristine turquoise blue ocean with views of the barrier reef. For the price you this is one of the best values and location that you will find. Ak'bol Yoga Barracks - Welcome to Affordable Community Living island style, Ak'bol's Yoga Barracks. Experience affordable retreats but also as an affordable night housing for all guests and groups: scuba divers, fishermen/women, kite boarders, destination weddings, sailors, backpackers, creative business trips, art groups, musicians and all other communities welcome... The Barracks are built with the many different budget travelers in mind. One night price of $35US. for a single person and $50. US for a couple. Casa del Rai - Conveniently located in the sought after Boca del Rio district in the town of San Pedro. During your stay enjoy the beautiful view of the ocean and the Great Barrier Reef from the roof top palapa/pool lounge area. You will also experience spectacular sunrise and sunset views from the rooftop lounge area or from your private front/back deck. Each suite has a fully equipped kitchen, bathroom, one or two bedroom and a futon/sleeper soafa in the living room for additional guests. Conch Shell Inn - Great room, Great price, Great location! All rooms are right on the beach in the heart of San Pedro, so within walking distance to anything and everything!! Enjoy tempurpedic beds, fast wifi, cable TV, refrig, private bath! Upper veranda w/kitchenette! Just steps away for diving/snorkeling/tours! The only thing "budget" are our rates, email for "specials" today!!! Martha's Hotel - Unbeatable prices all year round with taxes included already. Monthly rates available upon request during slow season only. Right downtown, only a block off the beach. Sandbar Beachfront Hostel - San Pedro's ONLY Beachfront Hostel located 1/2 mile north of town center on the beach. A/C, WIFI, Hot and Cold Water Included! Caye Management - Caye Management has a wide variety of beachfront homes, villas, condominiums and apartments to choose from. We have properties available for both long and short term stays. Paradise Villas, Nellie's Property Management - Born and raised in San Pedro, Nellie Gomez can find you a wonderful place to stay on Ambergris Caye, the jewel of the Caribbean. B-Lease - Photos - Prices - Descriptions, Long term rentals and Property Management Services on the Caribbean island of Ambergris Caye, Belize Homes - Apartments - Condos - Commercial Properties. Ambergris Vacation Rentals - A full service professional property management company offering short and long term rentals. With beachfront homes and condominiums, Ambergris Vacation Rentals can provide accommodations that will make your vacation truly unforgettable. And Ambergris Vacation Rentals is available to provide services to make your stay even more enjoyable such as free cellphones, transfers from Belize City to San Pedro, transportation to and from the airport, optional maid and laundry services, diving, snorkeling, fishing and mainland excursions, provisioning, chef services and golf cart rental. Sunrise Property Management - Individualized Belize property management services for vacation rental owners on Ambergris Caye. Our reputation speaks for itself. Every member of our team is known for their dedication to perfection. Our goal is to have our owners forget that we exist and to have their guests never forget their time in Belize. Sunrise Vacation Rentals - Our selection of beautiful beach villas and Belize vacation rentals are some of the finest options you'll find anywhere on the island. You can choose to stay in a luxurious 5 bedroom Belize vacation villa or a charming beachfront vacation rental just stops away from the Caribbean. We offer vacation rental options on the North and South ends of the island, as well as long term rental options for extended stays. Adventures in Belize - Many Belize travel and tourism packages and adventures available. Get great deals on hotels, scuba diving, fishing all inclusive or luxury resorts, accommodations and more! Barb's Belize - Travel services to Belize, Central America. Custom arrangements for rainforest & island vacations. Adventure tours, honeymoons, spas for singles, families, groups. Extensive personal experience. Belize Trips - is helmed by me, Katie Valk, a music business refugee from New York City. I vacationed on Ambergris some 20 odd years ago and returned in 1989 to see the mainland. Iím still here. We are much more than a travel agency or tour operator. We are Belize travel specialists. We love our work and all the activities and places weíll be talking with you about. We are well acquainted with the distinct flavors of each area of the country and have visited the hotels weíll be talking about. We pride ourselves on being up to date on current conditions and situations at each. Weíre enthralled by the Maya and their ancient cities, by life in the jungle, sea and in the air, by Belize people and their different ethnicities. Romantic Travel Belize - Click Here to connect to a Romantic Travel Belize destination consultant to help you chose the perfect location - free of charge, of course. Belize Jungle Trek - An adventure company that offers unforgettable adventure tours to some of Belize’s pristine destinations. We cater for the adventure people arriving on the cruise ships, visiting Belize only for the day and also to the overnight visitors, staying on San Pedro, Ambergris Caye or anywhere else in Belize. Our adventure tours are fun, safe, thrilling and a ‘must do’ while here in Belize. Visit “the best little Zoo in the world”, where you will find animals indigenous to Belize like the scarlet macaw, jaguars, howler monkeys and crocs just to name a few. Banana Bank Lodge - has been offering Belize horseback riding vacation packages and Belize tours to visitors world-wide for over thirty years. We specialize in Belize horseback riding which allows us to offer you a horseback riding vacation in one of the most beautiful locations on earth. We also offer a full range of Belize tours suited for a couple or the entire family. Contact us to arrange your Belize horseback riding vacation and/or Belize tours today. Breadfruit Gardens Guesthouse - is just a stone throw from Belize's International airport in the village of Ladyville and 9 miles from Belize City making it an ideal home base while exploring Belize's interior attractions. The affordable guesthouse which sits on two acres amidst the quiet, peaceful, residential subdivision of Lake Gardens is equipped with private room and bath or dormitory style rooms to accommodate individuals or large groups. The Western style house is handicap accessible, spacious, clean, safe, has handicap accessible bathroom, hot and cold water, plenty of ceiling fans, Wifi, and offers complimentary transfers to and from the airport. Rental options varies from individual rooms to the entire house and with or without meals. The Lodge at Chaa Creek - is located on a 400-acre private nature reserve in western Belize. We are pioneers in luxury adventure travel to Belize since 1981, offering Caribbean Reef & Rainforest vacations to thousands of visitors every year. Experience Belize’s culture, ecology, history and destinations with us. Costa Maya Belize Cabanas - Costa Maya Beach Hotel is the perfect choice for your Caye Caulker, Belize vacation. Relax on your patio and enjoy your surroundings. The moto of Caye Caulker is "GO SLOW" and at Costa Maya we hope you do just that. Costa Maya is perfectly located on the beach and within walking distance to the famous split and main village. Costa Maya offers a bird's eye view from its private rooftop. Each room offers views of the Caribbean Sea. A palapa hut where your hammocks are hung to relax and enjoy the shady breeze and amazing view. Considered one of the best spots on the island and the location of many island weddings. Falcon Hill Lodge - is located in the foothills of the Maya Mountains, just 25 minutes from San Ignacio Town. Central to many of the amazing attractions Belize has to offer, Mayan Ruins, zip lining, waterfalls, butterfly farm, cave tubing, etc. We offer 2 rooms, each with 1 Queen size bed (total 2 people per room), private bathroom (hot/cold water), veranda. We have an amazing bar/dining area that overlooks the jungle canopy. An excellent place to relax after a long day of activities. We will strive to make your stay relaxing, enjoyable, and memorable! Hamanasi Adventure & Dive Resort - Winner of numerous awards, Hamanasi is an ideal Belize resort located on a beachside private nature reserve and offers casual elegance & fine dining along with easy access to the best adventures Belize has to offer both on and offshore. Friendly, attentive staff will greet you with warm smiles and exceptional service. Our coastal mainland location lets you choose between scuba diving, snorkeling, birding, hiking, caving, Mayan ruin tours and more. Ian Anderson's Caves Branch - In the heart of the Belizean jungle ... overlooking the pristine turquoise waters of the Caves Branch River and nestled below a 100 foot rainforest canopy. We are not sanitized from the jungle .. we are a part of it. Wildlife surrounds us. Our various cabana styles are thatched in the tradition of the Maya and are completely screened offering a comfortable and bug free environment yet wide open to the symphony of nature. Lamanai Outpost Lodge - Unforgettable Adventures and Legendary Service, Belize's Premier Jungle Lodge. With comfortable accommodations and a highly praised daily menu, the Lodge features some of the most unique activities in all of Belize, including a night spotlight river safari, Lamanai Maya ruins tour, guided sunrise canoe trip, sunset lagoon trip, herbal medicine walk, guided birdwalk, dawn river cruise, and night jungle walk. Maruba Resort Jungle Spa - Relax amidst the richness and splendor of exotic birds and fauna. Our Jungle Falls swimming pool will cool you in the day and the Japanese tub will make evening star gazing an unforgettable experience. An oasis of charm and grace where everyday problems melt away. Maya Mountain Lodge & Tours - is a friendly, family run jungle lodge with air conditioned spacious rooms and cottages. Our amenities include a lovely swimming pool, beautiful nature trails, tropical gardens and a gourmet dining room serving ethnic dishes from Belize. Our property is surrounded by gorgeous Belizean rainforest with excellent bird watching, and other rainforest treasures. We also have an in-house tour company which is one of the largest and most respected in the country providing all inland tours including Tikal Mayan Ruins. Come enjoy the eco-adventure and exceptional service! St. George’s Caye Resort - A secluded paradise located on a private residence island just seven miles from Belize City. Accessible only by boat, St. George’s Caye feels miles away from everyday life thanks to its cozy cabanas, breathtaking views of the Caribbean, and the highest level of service in Belize. Divers, anglers and those looking to just get away from it all will find everything they desire at St. George’s Caye Resort. Oceanfront Villa at St. George's Caye - The Villa at St. George’s is ideal for small groups seeking the ultimate island getaway with 5-star service. Stays include airport greeting and roundtrip transfers, meals, and all amenities and services at St. George’s Caye Resort, an adults-only private island paradise and dive resort. The Villa features three air-conditioned bedroom suites adjoining a great room with picture windows and sweeping ocean views. The covered veranda has hammock, porch swing, and love seat for admiring the Caribbean. Yugadah Inn - This family-run hotel and restaurant, opened in 1997 in Hopkins Village, Stann Creek, is named after the Garifuna word meaning "coastal village". The sisters pride themselves at giving quality service to make their guests happy. One sister (Grace) was a part of the former Sandy Beach Women?s Cooperative. Joy, another sister, is a teacher who loves to teach and impart knowledge whenever she can. These two women, along with their mom, Rosie and other family members all pitch in to run the business. They are a wealth of information (and enthusiasm) about Hopkins and the Garifuna culture. Grace also makes homemade Garifuna dolls. These ladies work hard, cook scrumptious food and want their guests to relax and enjoy being in Hopkins! Gaia Riverlodge - Charming, small, full service jungle lodge overlooking Five Sisters Waterfalls, the five perfectly gushing waterfalls and the numerous crystal pools of the Privassion River, which meanders through the heart of the Mountain Pine Ridge Forest Reserve. Wonderful escape for eco tourists and nature lovers to get away from it all, with excellent bird watching, beautiful nature trails and Belize's only hydro-powered rainforest tram. Caracol, Belize's largest Maya site is less than two hours drive away. Lagniappe Provisioning - Lagniappe Provisioning delivers groceries, ready-to-serve gourmet meals, fine wines, beer, liquor and more just in time for your arrival. Mata Grande Grocery - We are the only grocery store north of the cut which is not affiliated with a resort. We strive to keep our prices low and happily service the needs of both locals and tourists. Our online shopping site offers a convenient way for tourists planning a trip to the island to shop and pre-order their groceries. Click here for more information on lodging and resorts in San Pedro and Belize.